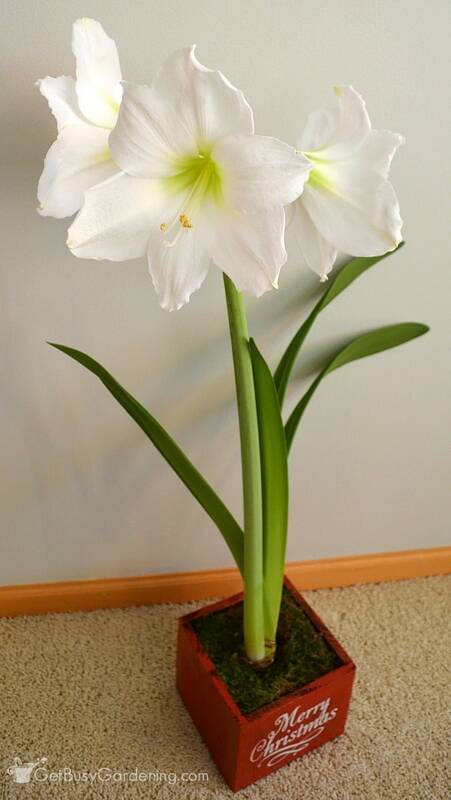 Christmas amaryllis is a very popular holiday plant that makes an excellent gift! But the best part about them is they can easily be grown as houseplants for years to come. Keeping these gorgeous holiday gift plants growing is easy, just follow these amaryllis flower care tips. Amaryllis are wonderful winter blooming plants, and are the perfect addition to your holiday decor. Even though both white and red amaryllis are classic colors for the holidays, these impressive Christmas flowers can come in a variety of colors. Christmas amaryllis is the gift that keeps on giving – for many years to come! When given the right care, your amaryllis will bloom for the holidays year after year. Plus, a brand new gift amaryllis will bloom shortly after the hustle and bustle of the holidays is over, which is the perfect time to keep away the winter blues. 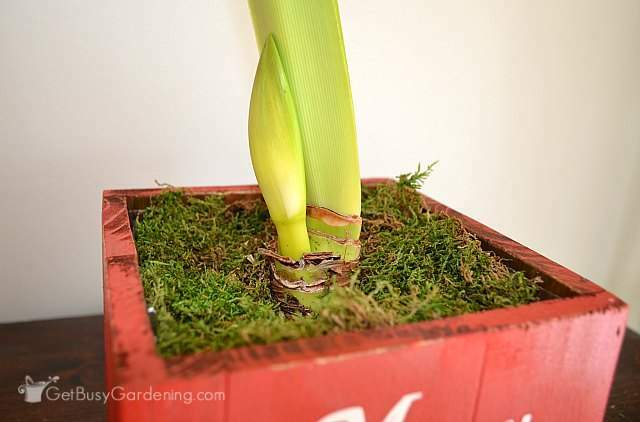 Potted amaryllis gift care – If you received a potted amaryllis bulb, then it’s easy because they require vey little care. Simply unpack the pot, give the soil a good drink of water, and put it near a sunny window. The soil should be moist, but not soggy. Christmas amaryllis bulb planting tips – If you were given an amaryllis grow kit, then you’ll need to take a few more steps to get it going. Don’t worry if your amaryllis kit didn’t come with soil, you can just use general potting soil to plant the bulb. Take care not to plant it too deep though, about 1/2 to 1/3 of the bulb should be sticking out above the soil. After planting the bulb in soil, water it well and put it in a sunny location. 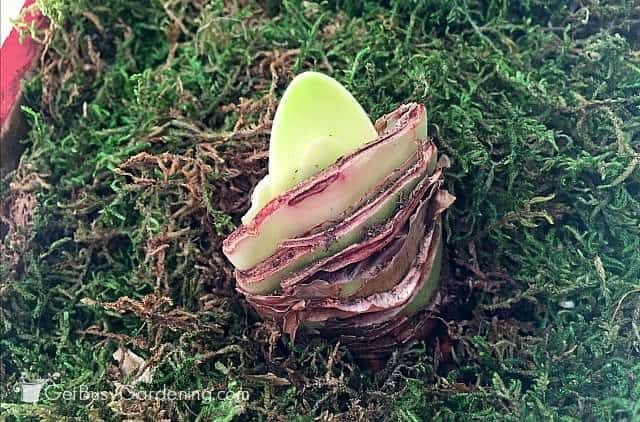 Waxed amaryllis bulb care – Waxed amaryllis bulb gifts don’t need any special care in order to bloom, they are ready to go right out of the box. 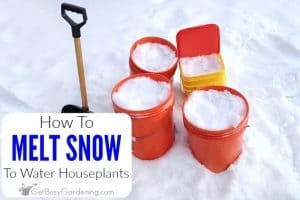 You don’t even need to give them water (and you shouldn’t try to)! Simply place your waxed bulb in a spot where it will get bright light, and wait for the flowers to start growing. It may take a few weeks for your amaryllis flower bulbs to wake up and start to grow, so don’t worry if they don’t do anything right away. They will begin growing soon enough. Also, keep in mind that your amaryllis might grow a flower spike first, or it might start to grow leaves before the flower. Don’t worry if the leaves start to grow before the flower does, this is common and doesn’t mean your amaryllis won’t bloom. Once your amaryllis starts to bloom, you can pretty much just sit back and enjoy the show. They don’t require much care at this point, but you may need to do a few things. 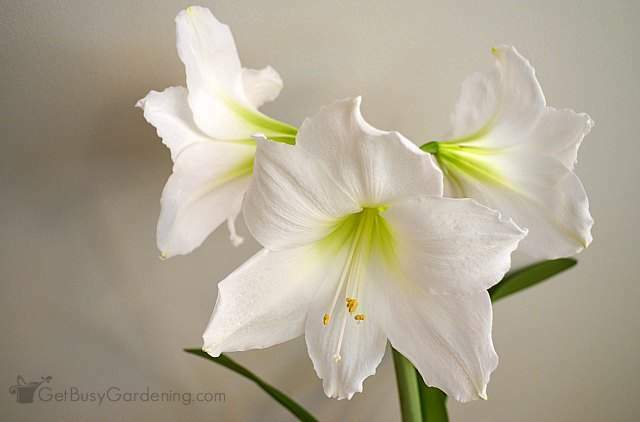 Below are some quick Christmas amaryllis flower care tips. 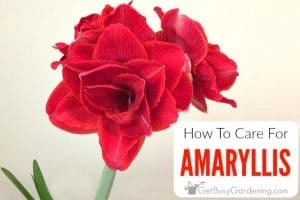 You can get my detailed amaryllis care instructions here. Once they get started, the flower stalks will grow pretty quickly. 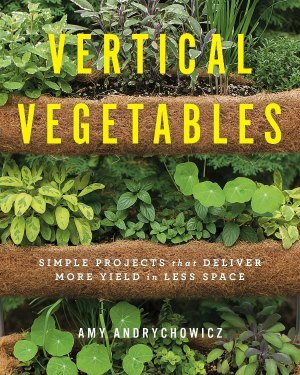 To keep them from growing leggy and reaching towards the light, be sure to put them in a south facing window. You could always add a grow light if the amaryllis stems getting too leggy. 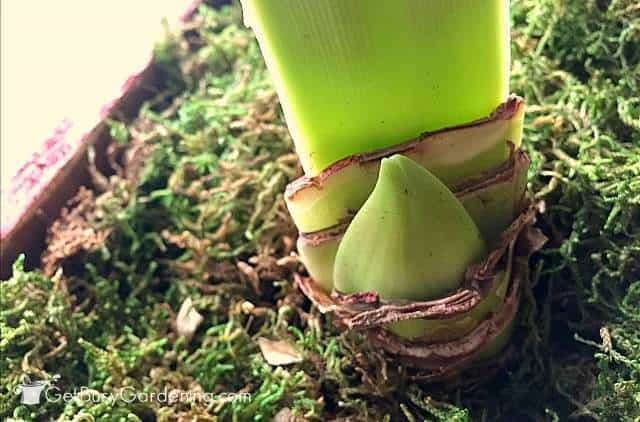 You can also turn the pot regularly in order for the flower spike to grow straight up if it starts to lean. Keep the soil evenly watered while your amaryllis is in bloom, but take care not to overwater it. Check the soil before watering your amaryllis, and only water it if the soil is getting dry. The soil should never be too wet or soggy. If the flower stem isn’t growing straight up, or it starts to flop over with the weight of the flowers, you can stake them using amaryllis stakes. How Long Do Christmas Amaryllis Blooms Last? Individual amaryllis flowers will generally last for 2-3 weeks. The flower spikes will grow three flowers, and most of the time those flowers will open at different times, extending the bloom time for several weeks. Depending on the type and age of the bulb, your amaryllis may grow more than one flower spike, making the blooms last even longer. To make the flowers last as long as possible, keep your plant out of direct sunlight once the flowers open. Many people toss out Christmas amaryllis bulbs after they’re done blooming. It’s such a shame because amaryllis plants are quite easy to grow, and make wonderful flowering houseplants. 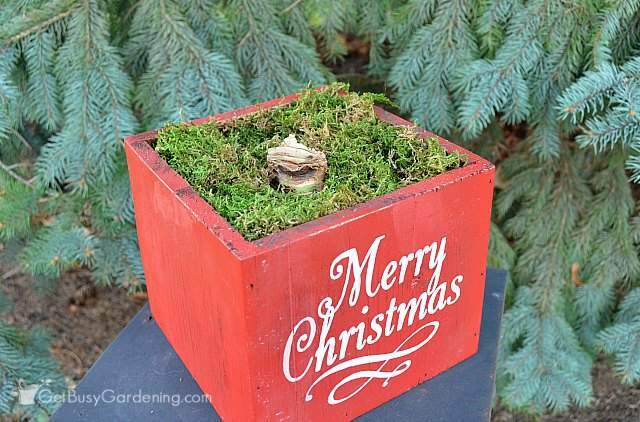 Plus, with a little bit of extra care, your amaryllis will bloom for the holidays every year. 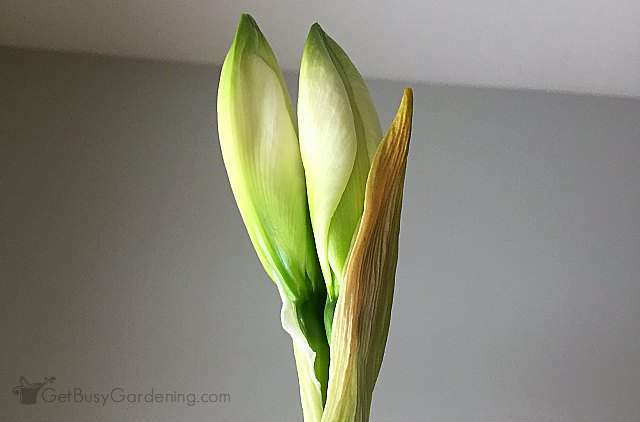 If you’d like to try your hand at keeping your amaryllis after all of the flowers have faded, then the first thing you need to do is cut off the flower stalk to the top of the bulb. This will help the bulb build the energy it needs to form flower buds for next year. Don’t prune off the leaves though. Leave them on the plant to continue growing and giving the bulb more energy. Water your amaryllis houseplant on a regular basis, but don’t overwater it or the bulb could eventually rot. Amaryllis plants can easily be kept as foliage houseplants with minimal care, or you can take a few extra steps to encourage them to bloom for Christmas every year. Once the weather warms up in the spring, you can move your amaryllis outside to a sunny spot for the summer. 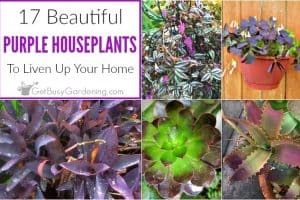 Then in late summer, bring them inside to a cool dark location, and allow the soil to dry out completely. This will trigger the plant to go into dormancy. Once the plant has gone dormant, remove all the dried leaves and don’t water it at all. Wait 6-8 weeks, and then bring the plant out of dormancy and give it some water – starting the blooming cycle all over again. If given the right treatment, your amaryllis will bloom again just in time for the holidays. Get the full step-by-step instructions for how to rebloom your amaryllis here. If you’re looking for the perfect gift for the plant lover on your list (or maybe a little holiday gift for yourself – I won’t tell), Jackson & Perkins has a great selection of Christmas amaryllis bulbs for sale online. 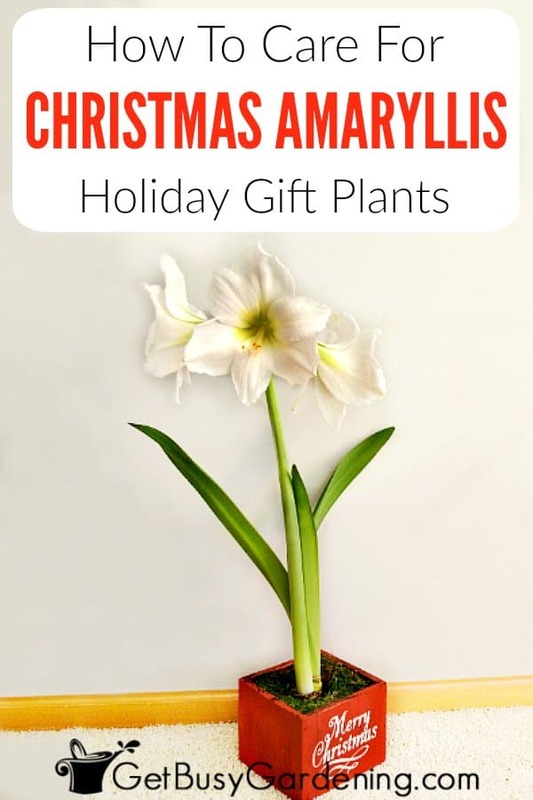 They have several other options for wonderful presents too – including amaryllis bulb kits, gift sets, and colorful waxed amaryllis bulbs, all of which you can find here… Amaryllis Gift Bulbs. Christmas amaryllis plants make great gifts for anyone on your holiday gift list. Those gorgeous blooms are sure to impress! 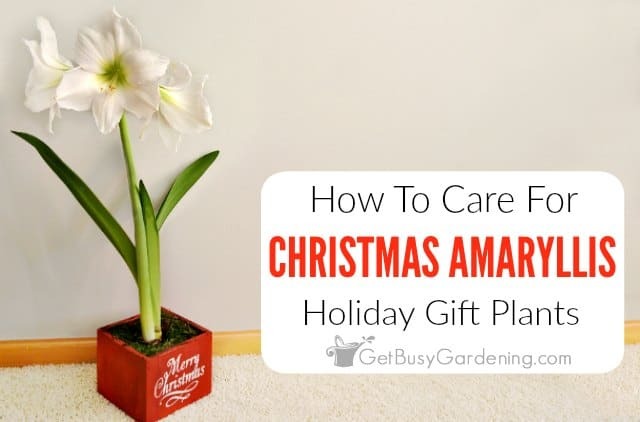 And with these simple amaryllis flower care tips, it’ll be the gift that keeps on giving. Share your Christmas amaryllis flower care tips in the comments section below. My wife an I love giving amaryllis for Christmas as gifts too, and go with the red. It’s embarrassing, but we have killed our in the past. Oops. You get so busy that you forget about everything you’re supposed to do. It would be great to have blooms more than one season. And I think they are okay for cats? We are adopting another rescue cat this week so we are trying to be careful about what plants we get. I totally hear you about trying to remember all the things you’re supposed to do, it can be overwhelming sometimes!! It’s nice to get an amaryllis to rebloom, but it’s also fun to buy new ones too!! 🙂 Amaryllis plants are not cat friendly. 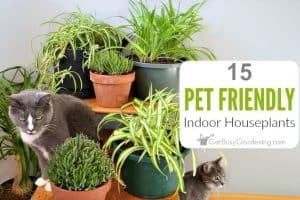 They are a type of lily, and all types of lilies are highly toxic to cats. 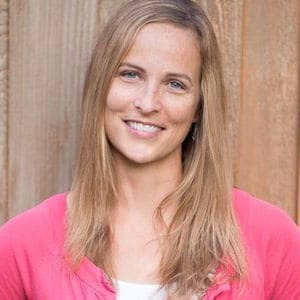 So, definitely keep this one out of reach of your babies. I keep mine growing in my sunny bathroom where no cats are allowed. Better safe than sorry, especially when it comes to kittens! Wow, these are truly beautiful. I will have to look for one at my grocery store. I noticed that they have a bunch of holiday plants in stock now. Do you have a Christmas Cactus too? Mine is blooming like crazy right now! Yes, I have both a Christmas cactus and a Thanksgiving cactus. Love them!! I’m growing amaryllis too. So far, all I have are the leaves. No stalk/flowers. Can it take a long time for the flower to appear?